I used a community cycle for the first time. We can rent a bicycle and then return it to any port in nine wars of Tokyo. 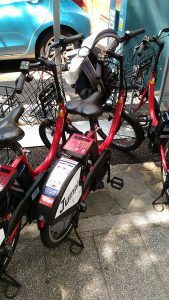 Seven-Eleven Japan, Docomo Bike Share and a company of Softbank group put ports together in 2017 ( THE YOMIURI SHIMBUN said ). The bicycle which I rent could change speed with gears. It started smoothly because it was a E-bike which I road for the first time. It had a large basket which could carry my knapsack. I was disappointed that its saddle was too low for me. I want to rent the next bike which saddle is more high. Few cars run on a road because it was Sunday, so I could ride easily. The rent for the bicycle was only ¥162 ( including taxes ). If you ride there in thirty minutes, the rent is this price. A mobile app “bike share” which has functions of searching ports and renting bicycles is useful.